The Pensioners’ new interim manager says the experienced pair could depart at the end of the season. NEW INTERIM CHELSEA manager Rafael Benitez has revealed Ashley Cole and Frank Lampard are likely to leave the club at the end of the season. The experienced pair’s contracts expire at the end of the 2012/13 campaign. Left-back Cole has been heavily linked with a move to Paris Saint-Germain, while Lampard is rumoured to be interesting Chinese Super League teams. Guizhou Renhe have claimed they made contact with the 34-year-old midfielder, but were not close to sealing a deal. 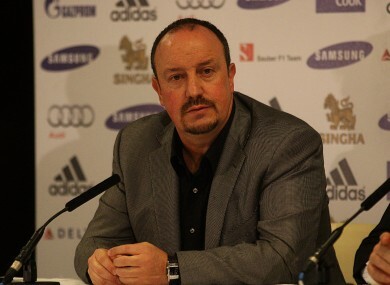 Benitez claimed he was comfortable working under demanding Chelsea owner Roman Abramovich, praising the Russian’s desire to win and expressing his belief that it would be easier working under the oligarch than controversial pair George Gillett and Tom Hicks at Liverpool. “The priority of the owner was whether I’m a good manager, a good coach, if the players understand me and if we’ll be a winning team,” he said. “He was very clear with that and happy with the things I’ve said. My impression of him was he’s a nice person. You can talk with him and he understands and he likes to see you have clear ideas. “I’ve had quite a lot of different owners, presidents and chairmen in my 26 years in football and they all liked to talk about football and find out what was going on. Fernando Torres is likely to start against Manchester City on Sunday, with speculation suggesting Benitez has been hired in order to get the best out of the former Liverpool striker. I don’t need to talk too much to Fernando because he knows me and what I’m looking for,” he said. “My idea isn’t just to improve Fernando but the whole team. Email “Benitez: Lampard and Cole set to leave Chelsea”. Feedback on “Benitez: Lampard and Cole set to leave Chelsea”.